The connected learning approach posits that when learning is connected across settings, it is more resilient and likely to lead to educational, civic, and economic opportunity. 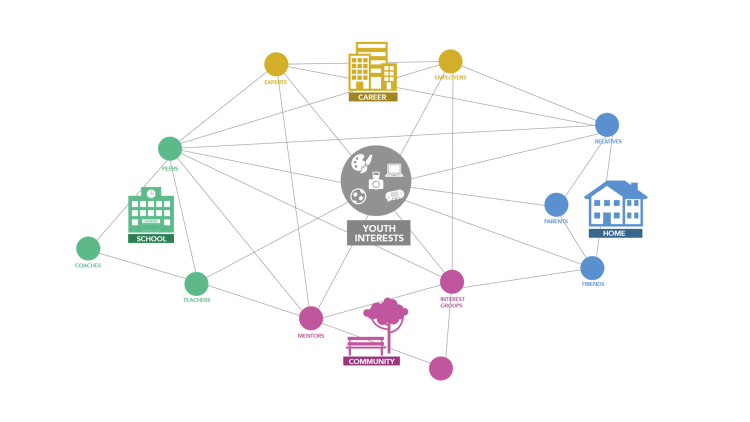 Research has demonstrated that many young people struggle to connect their interests and informal learning to their school-based learning and opportunities in their communities. This is particularly true for young people whose parents aren’t actively brokering these connections, and whose social networks don’t include others with high educational and economic attainment. Educators and learning institutions can play a critical role in brokering those connections, but we need more robust examples and frameworks for supporting this type of programmatic focus. For more background, see: Hive Research Lab white paper. This workshop will bring together researchers, educators, and designers who are studying, creating, and testing ways of brokering and connecting learning across settings. This can include, for example, efforts to develop internship and mentoring programs, badging pathways, or educator professional networks. It can also include research on connects and disconnects across settings, and how social capital intersects with learning opportunity. This will be a working meeting with presentations and small group discussion to hash out key frameworks, design features, and findings. We welcome submissions from a variety of disciplinary approaches and learning organizations. Applicants to the workshop will submit short papers, and selected papers will be published in online proceedings for the workshop. Papers can include case studies, worked examples, and research papers. Participants will also be invited to submit a longer paper to be considered for a special issue of the International Journal of Learning and Media (IJLM) on the workshop theme.